Before storing a vehicle, be sure to check with your insurance carrier. Many insurance companies offer coverage especially written to protect your car while in storage. Such off-road coverage can offer significant savings over the road insurance coverage. Gather the tools and supplies that you may need before you get started. Some supplies you will need to have handy are various quality cleaners and protectants, a tire gauge, plastic drop cloth, cotton cloth, moth balls and mouse traps. Other items you will need are plastic bags, duct tape, fuel stabilizer, WD40, desiccant sacs, jack and jack stands. You may also need a large wood block for the battery and thin wood trim pieces for under the windshield wipers. Make sure that you have adequate amounts of each type of fluid on hand to top off all of your fluids. Seal off all engine openings using absorbent cotton cloth. This will absorb any moisture to protect the engine. It will also deter bugs and mice from getting inside. Use a cotton cloth to fill other openings in the exhaust pipes and other openings. 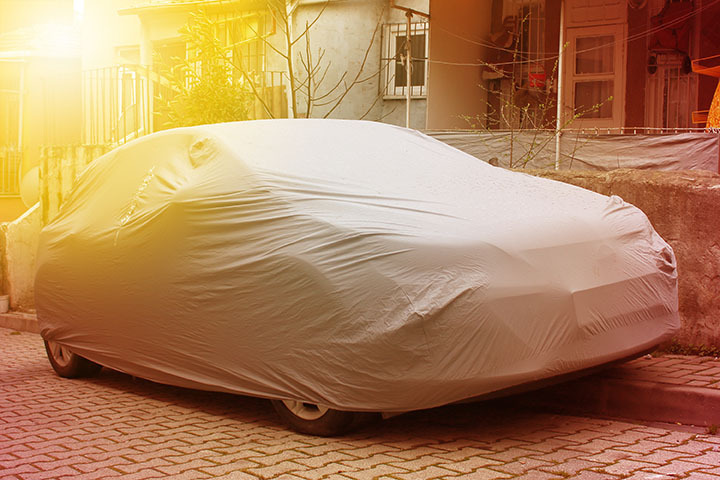 Be sure to write this down on your maintenance checklist to remind yourself to remove the cotton cloth when taking your car out of storage, prior to driving it again. Convertible Tops should be stored with the top left up. When the convertible top is left open for long periods, it can develop large, ugly looking creases. Treat the convertible top with silicone or another lubricant. Desiccant sacs can be placed inside the interior of the car on the floor. This will keep moisture that may form from humidity from damaging the top. Set mothballs around the outside of the car and mouse traps to keep pests away.